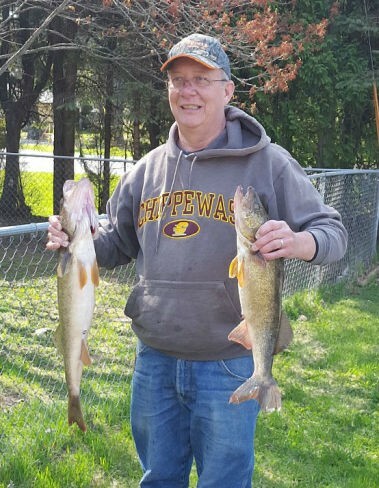 Allen K. Martinson, age 58, of Escanaba (Ford River), passed away Wednesday afternoon, April 3, 2019 at his home. He was born on April 13, 1960 in Escanaba, the son of Alvin and Leona (Green) Martinson. Allen grew up in Ford River and was a 1978 graduate of Escanaba High School. Following graduation, Allen worked at Wally’s United Food where he met the love of his life, Connie. The former Constance Knoll married Allen on June 4, 1983 at the Ford River Community Chapel. Together, the couple shared 35 years of marriage and raised 2 children, David and Lisa. In the early 1980s, Allen purchased the Brownberry Bread route, which he proudly operated until he passed away. Allen loved anything to do with the outdoors, especially hunting and fishing. He enjoyed taking rides on his side by side with his wife, Connie, and his dog, Louie. Allen looked forward to attending the Bark River Off Road Races each year and also enjoyed watching NASCAR and the Green Bay Packers. Allen loved spending time with his family and friends and will be missed dearly by all who knew him. Allen K. Martinson is survived by wife, Connie Martinson of Ford River; son, Dr. David (Dr. Emily) Martinson of Washington, D.C.; daughter, Lisa (James) Snyder of Sault Ste. Marie, MI; dog, Louie, cat, KC; grand dogs, Stella and Thor; sister, Sharon (Richard) Englund of Ford River; brother, Neil (Debbie) Martinson of St. Augustine, FL; aunts, Lorraine Green of Escanaba, and Ethel Rademacher of Ford River; as well as several nieces and nephews. Allen was preceded in death by his parents, Alvin and Leona Martinson. A celebration of Allen’s life will be held Saturday Afternoon, April 6, 2019 at the Martinson residence with close family and friends.